Miles Nimbus lubricants are premium quality gear and lubricating oils blended from high viscosity Index exxon/Mobil base oils. These oils contain additive systems which impart the superior lubricating characteristics required for gear lubrication, bearing lubrication, slides, ways and chain drives. Nimbus gear lubricants, through the combination of highly refined base oils and up-to-date additive technology, are more economical than oils of lesser quality and lower initial cost. Using Nimbus, in conjunction with a proper maintenance program, will result in longer equipment life. Both maintenance cost and downtime may be significantly reduced through the use of Nimbus gear lubricants. Recommended for: Miles Nimbus E.p. Gear lubricants may be recommended for the following applications: - gear lubrication including spur, helical, Bevel and worm gears - bearing lubrication including plain, ball, roller and sleeve bearings - any application requiring a.G.M.A./E.p. Gear oil - any application requiring shell omala, texaco meropa, Mobil compound, Mobil gear, exxon enmist, penoled or Spartan typical Test data: Ag MA 5Ep ISO grade 320 Flash, coc, F, D92 420 pour point, F, D97 0 copper corrosion, D130 pass foam tendency/stability, ml, D892 0/0 FZG load stage, pass, D5182 12 Timken OK Valve, lb. D2782 60 four ball EP, scar diameter, mm2, D2783 0.27 four ball EP, load wear Index, kg, D2783 45 four ball EP, weld point, kq, D2783 250 rust protection, distilled water, D 665a pass rust-preventive Test synthetic sea water, d665b pass demulsibility, D2711 free water, ml 85.5 emulsion, ml .3. 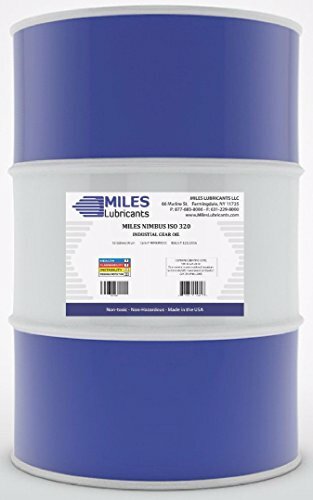 If you have any questions about this product by MILES LUBRICANTS, contact us by completing and submitting the form below. If you are looking for a specif part number, please include it with your message.